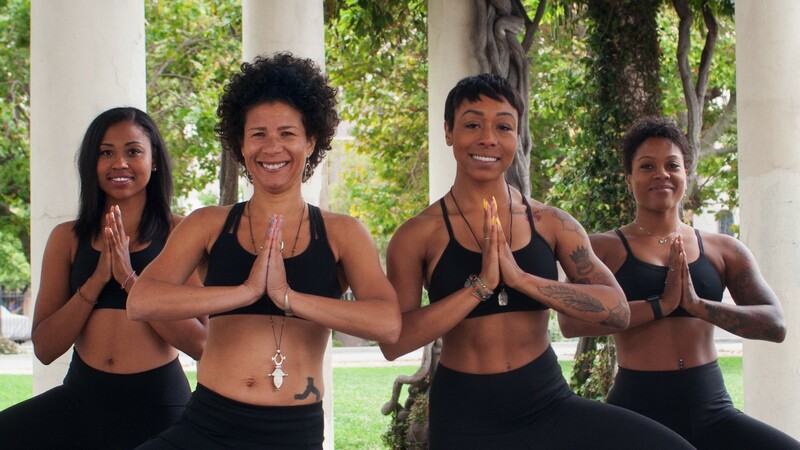 Kirsten Rogers, Maureen Miller, Shakira Scott, and Zenovia Forbes want to change the image of yoga. On a June morning at a coworking space in downtown Oakland, an unusual thing happened: Over 60 people attended a yoga class. What made this unusual was that the majority of those in attendance, including the instructors giving the class, were Black and Brown people. Despite its roots in India and Africa, yoga today is often seen as a predominantly "white thing." This is the case in the Bay Area, a place lauded for having progressive views and a diverse population but remains anti-Black in many ways. There have been allegations of racism within San Francisco's police force. According to a 2017 report by the Brookings Institution, the Black unemployment rate in Alameda County is more than double that of other races. And many Black people experience limited access to the services and cultures that the Bay Area prides itself on. The instructors of Black to Yoga aim to change both the perception and demographics of yoga practice by offering easily accessible and affordable yoga classes to not just people of color, but everyone. Black to Yoga is the brainchild of four Black, experienced yoga instructors. Founder Shakira Scott brought together Maureen Miller, Kirsten Rogers, and Zenovia Forbes after having an epiphany while teaching classes at a 24-Hour Fitness. "After my first year of teaching, I noticed how people were reacting to me as an instructor," she said. "I started to notice the shock on people's face when I unrolled my mat and turned on the music to start the class. After about a dozen people told me I was 'the first Black yoga instructor they've ever had,' and a white lady thanking me after the class for 'being the instructor,' I saw the demand for Black to Yoga." Miller had a similar experience with a few spaces as she began teaching. "Those places' efforts to attract more people of color into their studio were woefully lacking," she said. "More often than not, I was the only person of the African Diaspora on the roster." Miller recently returned from Ghana to study Kemetic yoga, the oldest recorded form. "Indra Devi, a white woman, is known for introducing yoga to the U.S. in the early 1900s, but it originated with Black people in Africa," she said. "In more ways than one, Black to Yoga is here to give it back." Prior to practicing yoga regularly, Rogers said she had been "chronically disassociated from my body." "I held my breath throughout the day, sucked my stomach in to shrink my waistline, and was perpetually tense," she said. "This tightening and tension in my body was so natural for me that I could not relax. Practicing yoga has been a transformational and restorative experience for me." That's why Rogers decided to become a yoga instructor, and now, she teaches yoga to teens in high schools, in youth centers, in a studio, and outdoors. Like with Miller, Rogers found the underrepresentation of Black and Brown instructors — and lack of spaces to encourage them — troubling. "When I take a yoga class, I am either the only Black person in the room or one of very few," she said. "Though the number of Black teachers is growing, we are still underrepresented." "I've noticed that most people of color are under the impression that yoga is a religious practice or something they should shy away from," Forbes added. "Everyone should gain a conscious understanding of what yoga is and how it can heal the body." Black to Yoga spaces are quickly becoming epicenters for many forms of healing. Each class provides tables for local vendors such as Teas With Meaning, Bodacious Bombshell essential oils, and Iyoba hair and skin products, a mainstay of the Black East Bay since the early days of the Ashby Flea Market. The community response has been just as rapid with praise and support. Scott has taught several intro-to-yoga classes at Marshawn Lynch's Fam1st Family Foundation Center, and Golden State Warrior Damian Jones was a recent attendee. Along with planning on giving classes in San Jose, Sacramento, and Los Angeles, Black to Yoga's founders are reaching out to local professional sports teams to teach classes, create community, and build partnerships. In the not-too-distant future, they see creating a festival that incorporates yoga, healing, nutrition, and music. "A Wanderlust on the Black hand side," one of the founders quipped. The Bay Area is place of great contradiction: On the one hand, there is a diverse population and a cultural capital unique to anywhere else in the country. On the other, there is accelerating gentrification along with rising anti-Black rhetoric and actions that have permeated all facets of Black life in Oakland, extending from segregated spaces and a massive wage gap to cops being called to barbecues at Lake Merritt. It's a shame on the Bay Area that Black to Yoga must exist. More than ever in recent memory, folks in the Bay Area need to walk the walk and talk the talk that goes with that "Black Lives Matter" poster in so many windows. Until that day comes — if ever — spaces like Black to Yoga are necessities to keep Black and Brown people healthy and aware. Black to Yoga takes place monthly in Oakland, with the next one on Saturday, Aug. 18. Learn more at Facebook.com/BlacktoYoga. Editor's Note: An earlier version of this story misspelled Zenovia Forbes' name. It also attributed a quote regarding Wanderlust to Shakira Scott, but it was spoken by someone else.